Is anyone else scared of butchers or is it just me? A while ago, I summoned the courage to visit McKanna Meats (aka Theobald's Butchers) on Theobald's Road in Holborn. I had £50 in my pocket, a huge jute shopper bag and absolutely no idea what I wanted. Although it was 4pm (ie not lunchtime or after work), there was still a huge queue, so I spied on what the people in front of me were buying - one guy bought about ten kilos of diced venison. 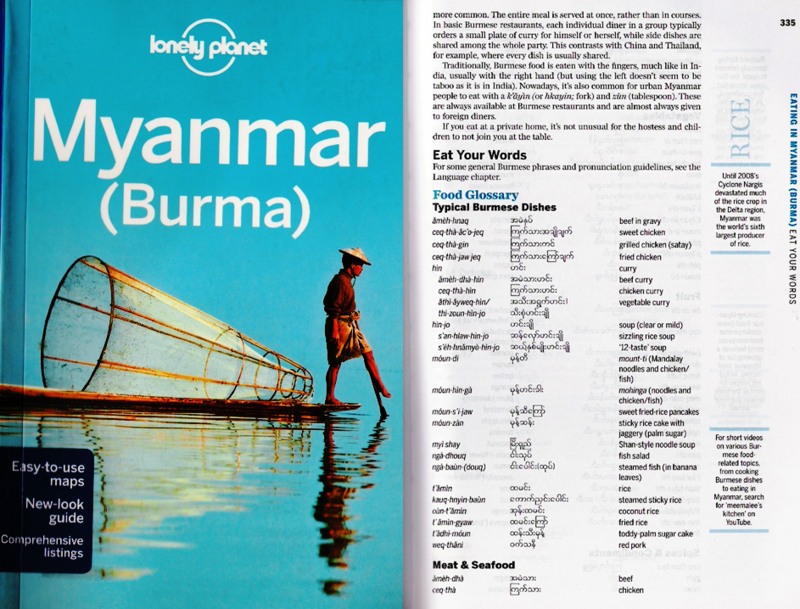 Anyway, finally it was my turn and the kindly butcher says "And what can I get for you, madam?". Bad start, although I'm nearly thirty, it still disconcerts the hell out of me to be called "madam". Anyway, it made me forget the power of speech and so I began randomly pointing at things. In the end, I came away with four quail, six venison sausages, one diced rabbit, four fat pork chops, two herby lamb racks, two lamb shanks, a duck confit, a bottle of Lingham's chilli sauce and a kilo of ox cheeks. The whole lot came to £50.50 which seemed pretty good value to me. 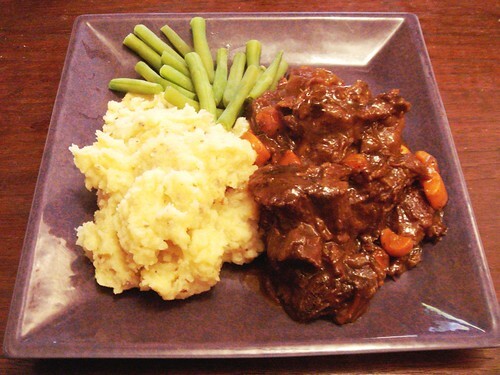 The ox cheeks were a whim based on Heston Blumenthal's "Big Chef Takes On Little Chef". He'd added them to his revamped Little Chef menu as "braised ox cheeks slowly cooked in a rich red wine sauce with mushrooms, served with mashed potatoes" (the new-style Little Chef Popham still appears to be going strong) and I thought "I could do that". The butcher had actually been very dubious and even asked me "What're you going to do with those then?". So I said that I'd put them in a stew and that's basically what I did. Stewing was a fab idea as it turns out ox cheeks are very similar to oxtail without the bony bits! The gorgeous gooeyness means you don't need flour to thicken the gravy. 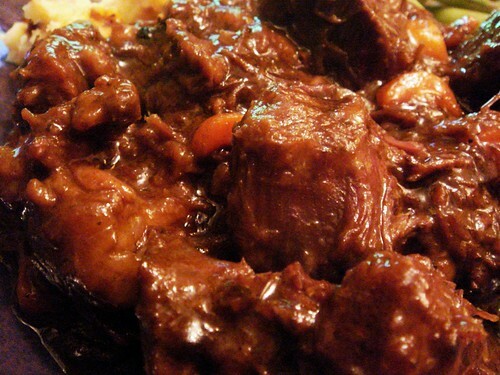 Dust the ox cheek chunks with flour, salt and pepper, heat the oil in a large casserole or saucepan and brown the meat. 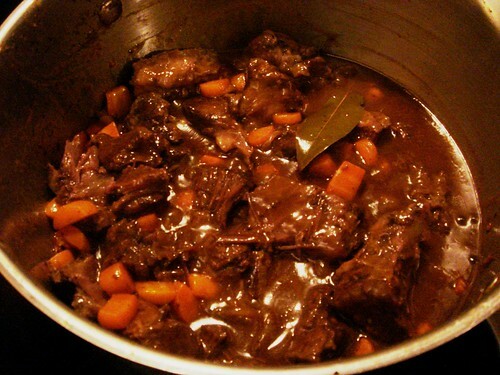 Remove the ox cheeks, deglaze the saucepan with a little water, then replace the meat and pour in the beef stock and wine. Bring to the boil, add star anise, bay leaf, Marmite, sugar and then season. Reduce heat and simmer for about an hour. Meanwhile, boil the potatoes in salted water until soft, remove from the pot and then use a potato ricer to mash them back into the pot. Add the milk, butter, Kewpie Mayo, salt and pepper and fold these into the mashed potato whilst warming it gently. 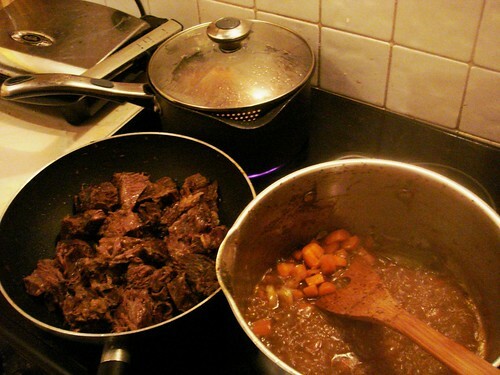 When the ox cheeks are tender, remove them, add carrots and onions to the saucepan and vigorously boil the liquid to reduce it to a thick gravy. 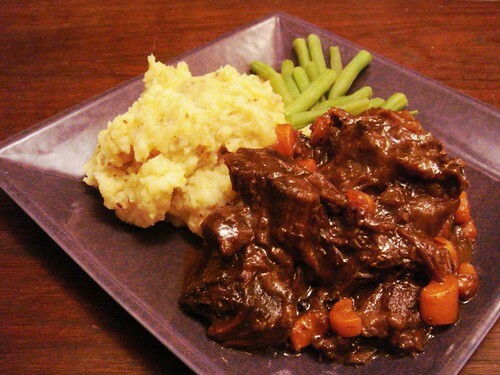 Replace the ox cheeks, warm through and then serve with the mashed potato. Oh, that sounds good! 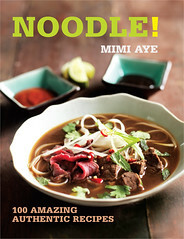 Especially the bit about it being like oxtail without the bony bits... I do find oxtail bones annoying. Best thing is that ox cheeks are super cheap - less than £6 for a kilo! A lot of butchers sell them now and Waitrose does too. Ox cheeks make me smile! pfff.. :) My sister cooks with kewpie mayo all the time. Great post! Argh - I didn't realise you were from Radiused Corner - I LOVE your blog - oh and thank you for adding me to your blogroll! This looks delicious - a butcher actually gave us about 6 kilograms of cheek for free today, so here I am looking for recipes! I'm definitely trying this one, thanks. @The Handmaden - Free?? Where is this butcher - where? ?